US, 1948, 126 minutes, Black and white. Charles Boyer, Ingrid Bergman, Charles Laughton, Louis Calhern. 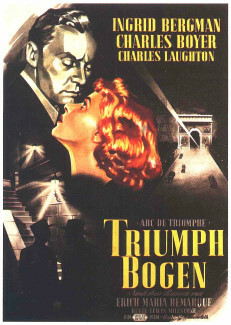 Arch of Triumph is based on a novel by Erich Maria Remarque. The film itself was an ambitious look at Paris prior to World War II. However, the film is very tedious to watch. Most of it is conversation, repetitious, a strange relationship between Ingrid Bergman and Charles Boyer. The setting is refugees in Paris prior to the war. Ingrid Bergman is a woman adrift who hangs on to any man who is able to support her. She does the same with the refugee doctor, Boyer, as Dr Ravic. However, he has to leave the country at various times to avoid deportation and return without a passport. In the meantime she takes up with another man who wants to marry her. The anguished performance by Ingrid Bergman seems at time intense but at other times verging towards the ludicrous. Charles Boyer is very serious-faced. Charles Laughton also appears briefly as a Nazi torturer who befriends Boyer at the end and goes unwittingly to his death. Louis Calhern does better as a doorman at a nightclub in Paris, a refugee from Russia. With the film's ambitions, and the attempt to re-create Paris and Antibes in the 30s, it turns out to be rather a melodrama with disappointing impact. (It is said that the box-office failure of the film caused the downfall of its studio, Enterprise Studios). 1. An ambitious film? France and Paris prior to World War II? Refugees in Paris and their precarious life? Visits from Nazis? The outbreak of war? 2. The black and white photography, the re-creation of Paris? The Riviera? Musical score? 3. The film as a box-office failure? The reasons? The drama, the action taking place off-screen rather than on-screen? The long conversations? The length of the film? The studio re-creation of time and place? The performances and the lack of rapport between Ingrid Bergman and Charles Boyer? 4. The plausibility of the plot, the focus on the refugees in Paris, the hotels where they lived, difficulties with passports? The managers of the hotels allowing them to stay? The nightclubs, the atmosphere of affluence and the lights in Paris? 5. The focus on Dr Ravic, his work as a doctor, refugee? Moving in and out of the country? Undetected? The flashbacks and the torture by Haake, the death of the woman? His trying to avoid him in Paris? The encounter with Joan, the on-and-off relationship? The reticence with which the relationship was presented - Boyer in suit, Bergman well dressed? Only suggestions of what might really have been happening? His befriending her, the dead man, helping her with the room, the relationship, going to Antibes? His disappearance, his return to the country, finding her again? Her phone calls, the time passing and the tense relationship? Her wanting to marry? His reaction? Finding Haake, setting him up, the drive, killing him? The irony of Joan being shot? The operation, attending her while she died? His future with the outbreak of the war? 6. The character of Joan, her being stranded in Paris, dependent on men, the death of her protector, the encounter with Ravic, dependence on him, apartment, hotels, outings? Her singing in the club? Going to the Riviera with him? The other men, the casino, his disappearance, her dependence on Alex? The phone calls, the meetings, the passing of time, her indecision? The melodrama of her character? Her being shot by Alex, the long dying speech? A credible character or not? 7. The Nazi, torturing Ravic, appearing in Paris, Ravic avoiding him? Reappearance, pride in remembering faces, not recognising Ravic, the talk, wanting him to set him up with women, going on the trip, suspicions, his death? 8. Morosow, the refugee, genial, supportive concerned about the refugees? His work at the nightclubs? Supporting Ravic, helping Joan? 9. The life in Paris at the time, the anticipation of war, the refugees, the hard life, the easy life, survival? 10. The film was considered a failure, in its time, seen now in retrospect?